You’ve got a piece of the rock ready to build on. You’ve got financing. You’ve got a house plan. You’ve got a site plan. Before that first shovel goes in the ground, however, you’ve got some pre-construction chores to take care of. Issued by your city or county building inspector. You’ll need your house plan, specification sheets, site plan, and your checkbook. 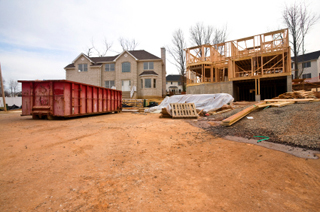 Cost of permits can vary widely by area. It just depends on how sadistic your city council wants to be. Post the permit at the job site. Take a copy of your building permit to the local utility to obtain temporary power and water for your job site. You can’t build without them. Again, take your checkbook and be prepared for it to hurt. 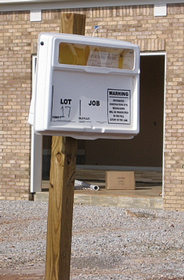 Have one delivered to the job site and placed in a spot that doesn’t interfere with material delivery or utility tap. The front corner of the lot usually works best. 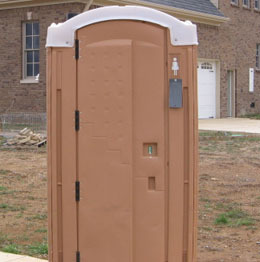 The crown jewel of any job site. You’re required to have one. The plastic walls of this unavoidable eyesore can provide some cheap entertainment. Construction worker graffiti is in a class by itself. Here you will see examples of dementia not yet catalogued by science. You’ll get over the shock however, and want to contribute some yourself. And be prepared to see your unit lying prostrate occasionally. Portable tipping is benign vandalism that no normal kid seems to be able to resist.